Third Saturday of September: Bring your apples, press ours, or buy cider. Vendors, food, craftsmen and musicians all day. Fun for the whole family. We will have both the old and new parking lots available for this event. Admission: $5.00 for individuals. $20.00 for families. Admission is free for our members, including volunteers who have worked at least 10 hours for us this year. 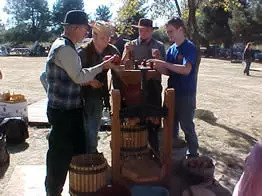 Cider pressing: If you’re bringing apples, please bring them to the parking lot on Eagle Creek Road. Live music, folk dancing, kids games, tours of the houses, store open for historic books, toys, games and souvenirs, 1860’s barn with corn-grinding and cross-cut saw, Build a log cabin, use the laundry scrub board and wringer, check out our wagon shed, and visit our vendors. Blacksmithing and kids crafts. Good food, including hamburgers, hot dogs, and Joe’s Donuts! Please note: on the third Saturday of September there is a limit of 2 gallons per family, so everyone can have a turn. Please bring your apples to the bulk squeeze on Sunday afternoon from 2:00-6:00 for unlimited squeezing. AND if you have later apples to press, we will offer an additional bulk squeeze from 1-4:00 on the third Saturday of October. There is no admission charged for the bulk squeezes, and all parking is in the Eagle Creek lot.